unleashing the punishment against them. God would only bear Judah’s sin 40 years. 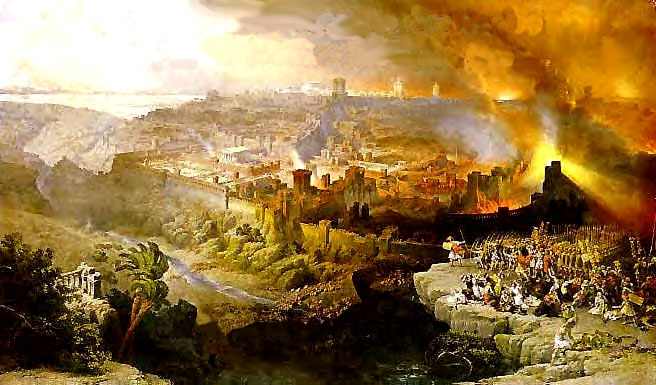 year link between the division of Israel and Judah and the destruction of Jerusalem. became the head of the Roman Empire. Ussher, Annals of the World, op. cit., 67-68. Wiersbe, The Bible Exposition Commentary, op. cit., 172; Pfeiffer, Charles F., ed. The Wycliffe Bible Commentary, (Chicago, IL: Moody Press, 1981), 713-714; Dr. Henry Morris , The Defenders Study Bible, (Grand Rapids, MI: World of Publishing Inc., 1995), Ezk 4:4-7 notes; and The Net Bible, 1st Beta Edition, (Dallas, TX: Biblical Studies Press, 2001), footnote 13, 1537. Flavius Josephus, Josephus Complete Works, trans. by William Whiston, (Grand Rapids, MI: Kregel Publications, 1960), Wars of the Jews, V. 13, 7.